make it perfect: .Tiny Tommy. It seems everywhere we go, the first thing people say about Tommy is, "he's so tiny!" - and he is! 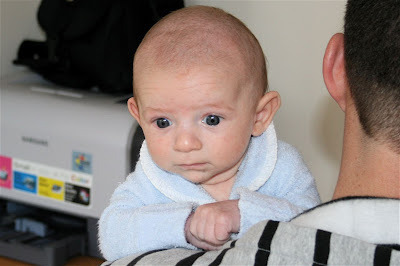 He was small when he was born and even though I thought my ultrasound dates said was 5 days overdue, the midwives who looked after us in the hospital and at home all made the comment that they thought my dates were wrong and that he seemed premature. 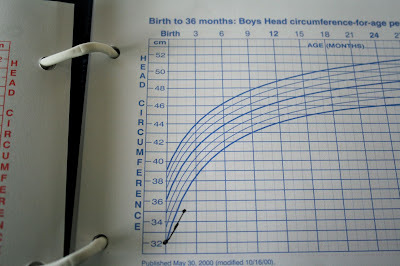 This is his head circumference, he started out on the bottom line (meaning that 97% of babies are bigger than him) but is now measuring under - no wonder he was so easy to push out!! 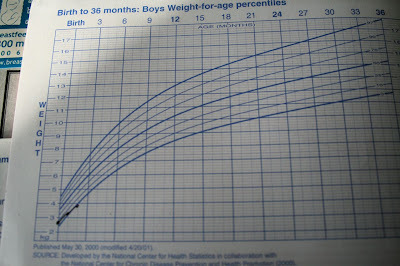 And his weight and length. They are in proportion to each other, so nothing to worry about. As long as he continues to gain then he is doing fine. He goes for another check up this Thursday so it will be interesting to see how much he has grown as these assessments were from 2 weeks ago. I was SO good and stuck to it for 2 whole weeks. I definitely noticed a huge difference after about 4 days. 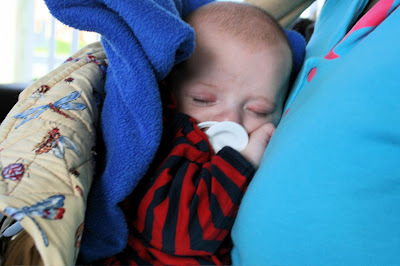 He was sleeping for longer periods of time during the day and a lot more settled in general. Then we had family come and visit so I thought I would have a break and eat what ever and see if it made him bad again. He was okay, but was also getting lots of cuddles and there was a lot going on to distract me so it probably wasn't the best time to experiment!! 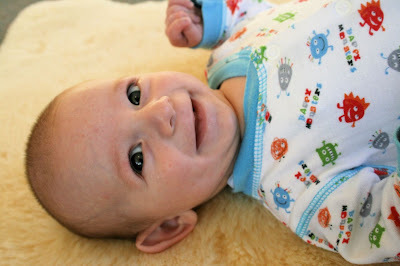 Tommy has been unpredictable since then, has good and bad days - that's just typical of a baby though! He seems to have trouble passing wind and I think that is the cause of broken sleep during the day. Whether that is dairy related or not, I don't know? Hopefully it is something he will just grow out of because it will be so nice when he starts having longer sleeps again! Today was one of those "15-minute naps" days. Such a pain, especially because he is tired and I can tell he wants to sleep for longer but just ends up being grumpy all day instead! I gave in at 3pm and ended up putting him in the Ergobaby (thanks for the lend Suzanne, I love it!) where he finally drifted into a peaceful slumber and I could clean up and cook dinner in peace! He is such a little munchkin! So cute!! Glad he is having better days - hope you get more and more of them very soon. He's such a little cutie. Look at that amazing head-control! He may be little,but he is strong! You have a beautiful boy! aww hes lovely and such a cute smile! He is a 'little' cutie. 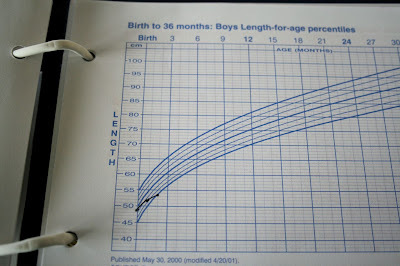 My Isaac was always below the percentile lines. Now he's taller than me and working on his dad! Where does time actually go, I wonder? He looks just perfect to me...such a cutie! Its nice to see him smiling, so precious. He won't be tiny for long, he'll be big and running around before you know it! should have checked your blog before playgroup!...sorry- all the info i asked was right here. hope the check up went well today. great things come in small packages i say :)... gorgeous boy.